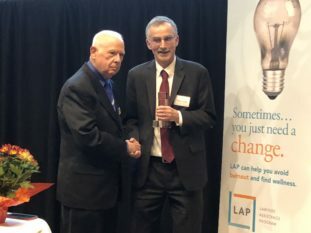 Northern Illinois University College of Law was honored by the Lawyers’ Assistance Program (LAP) with the Warren Wolfson Excellence in Education Award. The award, which was presented during their annual dinner, recognized the College of Law for its dedication to improving the well-being of its students and promoting the Illinois Lawyers’ Assistance Program within its community. The Honorable Warren Wolfson (ret.) presented the inaugural award to the NIU College of Law, noting that the award represented law schools getting off the sidelines and becoming part of the solution. He commended NIU Law for being at the forefront of law schools on this issue by leading the way and setting an example that will enhance the legal profession and protect the public it serves. “NIU is the first law school that I know of to host LAP training for its administration and staff,” Judge Wolfson commented. In addition to training its staff, NIU Law also offers a course for its students called, The Mindful Lawyer. The course teaches mindfulness and how mindful practices can not only bring well-being but make you a more effective lawyer. Founded in 1980, the Illinois Lawyers’ Assistance Program was created to help Illinois lawyers, judges, law students, and their families concerned about alcohol abuse, drug dependency, or stress related issues like anxiety, burnout, depression, and many others. Their services include individual and group therapy, assessments, education, peer support, and intervention.